This is a great way to learn the fundamentals of firearm safety and accuracy before taking the Concealed Carry class or any other firearms course. We will partner you with one (or more) of our NRA\MCRGO Certified Firearms Instructors at a rate ranging from $50 – $75 per hour, per person. They will teach you how firearms operate, how to use them safely, how to load, fire, unload a variety of firearms, and how to clean the various firearms. Typically, during a 2-hour private lesson, we can cover the same material that would be covered in the NRA Basic Pistol course which lasts over 8 hrs, with the only difference being we do not cover guns you are not interested in; you will not leave with a certificate of completion, just the most important parts…knowledge & Safety! A private learning environment ensures all of your questions will be answered and you understand everything you need to before you leave. This course is designed for the student that has a basic knowledge of firearms and firearm safety or none whatsoever. This course covers firearm safety rules & storage rules, marksmanship, self-defense and legal requirements for using a handgun for personal protection and discusses various options for concealed carry and using/storing a firearm in & out of the home. This course exceeds what is required by the State of Michigan if you want to apply for, and receive your Concealed Pistol License. Every great athlete/competitor has to start with the ESSENTIALS! If you take your own, as well as your family’s safety seriously, then you should start with that as well! This course is completed mostly on the range. We will meet at the classroom in the morning for check-in, and then have a discussion about what we consider the essentials of pistol shooting, the proper mindset for carrying and using a handgun in self-defense, review carry tips, equipment selection etc… After this discussion, we will head to the range & move to the firing line to work on the human contact with the gun (unloaded) even before we start shooting live rounds. We begin with the essentials/fundamentals to make sure everyone has those mastered. The grip, your stance, using your sights etc.. All of our drills are designed to better prepare you for the battle we hope you never have to get involved in. We will also cover drawing from the holster, increasing speed of shooting while maintaining accuracy, shooting from various positions, shooting and moving and more. This class is perfect for those that already have their CPL or have handled a handgun before and they are looking to better prepare themselves to use a handgun in self-defense. This is not a course for those who have never shot a gun or who have very little experience (You must know the nomenclature/names of the parts of the handgun and how to operate YOUR gun before you may attend). This course is a great follow-up to Intermediate Pistol, but you are not required to have completed our Intermediate Pistol course prior to this; you only need to have verifiable pistol shooting and holster-drawing experience There is a pre-qualification. Please ask for details. Your training and practice should never stop, and this is a great class to enhance your current skills and hopefully teach you some new ones as well. We will go over advanced techniques that cover all aspects of concealed carry. This course combines a short classroom session with an extensive range portion. At the range, we begin with some dry-fire techniques and then work through various drills as a group and certain exercises as individuals. All of these drills and exercises are designed to simulate possible situations you could find yourself in when you need to use your firearm in self-defense. Your skills will be put to the test with each drill and at the end of class we have a couple ‘fun’ challenges. This course does require a minimal amount of physical exertion. If you have any health concerns or prior injury concerns, please contact us before you sign up to inquire about your specific situation. At least 300 rounds of ammo (You may go home with some, but it’s always better to bring too much, than not enough! A Good Attitude, An Open-Mind, and A Willingness to Learn! Payments may be mailed in (by Check to AZO Civil Services), or made in person. In-person payment may be in the form of Cash or Check (Preferred) or Credit/Debit Card. ALL payments MUST be made at least 7 days prior to the class date. This is always on a first come, first served basis, so get your payments in early to avoid being removed from the class. This course will cover the basics of operating, using, disassembly, cleaning and reassembly of rifles in the AR/AK platforms. Please stay tuned while our Lead Carbine Instructor, Corey, works out the curriculum for this class! If you cancel any firearms class with more than 7 days notice, you are entitled to a full refund minus a 25% administration fee. Alternatively, you may transfer your entire payment to a new class taking place within 90 days of the original class. This type of transfer can only happen once. If you cancel your class with less than 7 days notice, you forfeit your entire payment for that class and will not be refunded any money. You may, however, transfer the entire payment to a new class taking place within 90 days of your original class with no further penalties. This type of transfer can only happen once. If you do not show up at the appropriate date and time for your class without informing us (No Call, No Show), you forfeit your entire payment for that class and will not be refunded any money. You may NOT transfer the money to a new class, and you will have to pay in full for another class if you choose to register in the future. For extenuating circumstances, (Family Emergencies, etc…) you MUST contact AZO as soon as possible and our staff will determine if we can refund your money or get you transferred to another class instead of losing your entire payment. This is handled on a case by case basis and is at the sole discretion of AZO Civil Services. Any questions regarding our cancellation policy, please write, call, or stop in to see us during our regular business hours. 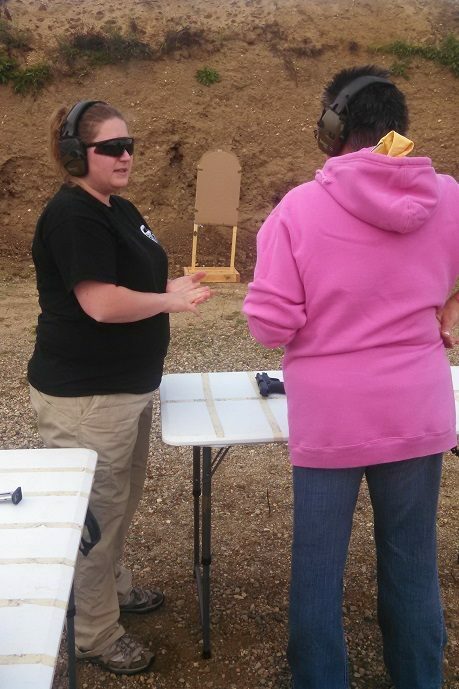 AZO Civil Services offers a variety of firearms training courses. We have classes for someone who has never shot a gun before and wants to learn how to handle it safely, all the way to advanced pistol, rifle, and shotgun training. Read the descriptions on this page and then check our calendar for the class of your choice. If you have any additional questions, please do not hesitate to call or e-mail us.